Time to talk ball: Manager Scott Servais joins Art Thiel at the World Trade Center Seattle at 5 p.m. Tuesday for a live Q&A about the 2018 Mariners, including happy hour eats. In the one-year absence of Mariners FanFest (no walking on the new Safeco Field grass), we have a January alternative: The chance for baseball fans at the Sports Salon to ask manager Scott Servais what the hell happened last season and what the hell is going to happen this season. Not only that, but good food and drink will be offered at one of the Seattle waterfront’s premier locations. Starting with a 5 p.m. happy hour at the restaurant the fourth floor of the World Trade Center Seattle (opposite Anthony’s Pier 66), the third-year field boss will join me at 6 p.m. for a Q&A session about the 2018 team. Then it’s your turn to dig up the inside scoop on the Mariners a month ahead of spring training in Peoria, AZ. Servais will talk about his flashy new centerfielder, Dee Gordon, a new first baseman, Ryon Healy, and a plan to work in a sixth starting pitcher to spread the workload and help avoid injuries. Since it’s the day before the Baseball Hall of Fame voting is announced, he’ll pass out sticks and rocks to throw at baseball writers should they fail to elect his hitting coach, Edgar Martinez. If you want to flatter Servais sufficiently to get a pitching tryout (hey, most of Seattle pitched for him sometime in 2017), tell him you know where he was 30 summers ago and saw what he did (won an Olympic gold medal with the U.S. baseball team in the Summer Games in Seoul). Don’t be bashful about asking him his plan to overtake the world champion and AL West rival Houston Astros (hint: It starts with locking Jose Altuve in the overhead bin after the flight lands at Sea-Tac). Tickets at $35, which includes appetizers sufficient to call them dinner, are available at Brown Paper Tickets here. Parking is available in the WTC garage. Bucknor looks like he’s grinning in the picture. 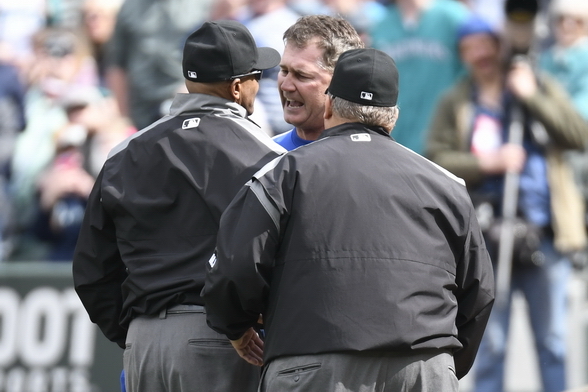 Nice to see Servais continuing the tradition that Lou started and screaming at Bucknor.